Trains Today: Comment: Should the East Coast franchise stay public? Comment: Should the East Coast franchise stay public? The tendering of the new East Coast Franchise, to begin in 2015, has sparked much discussion and debate about how rail services should be run in the UK. Since 2009 when operator National Express 'handed back the keys' on the East Coast route due to financial difficulties it has been run by the government- under the banner of Directly Operated Railways (DOR). An East Coast HST is pictured in Northumberland. Directly Operated Railways took over running of the East Coast Route after it was handed back to the Government by National Express. The HST wears an interim livery in National Express colours with 'East Coast' branding. The franchise will return to the private sector in 2015. DOR has been one of the success stories of the railways in the last few years- the route which crippled both GNER and National Express has become one of the most popular in Britain- and it turns a good profit which is payed back to the treasury. Many therefore feel that the line should be kept as it is, running successfully under government control. It could provide a useful benchmark for other privately let franchises and avoid the costly process of tendering to another unknown operation while maintaining stability on the route. This is all very well, however it totally undermines the whole idea of a privatised railway. I do not subscribe to the camp that Britain's railways should be re-nationalised. It is clear without doubt that private enterprise has done wonders for rail travel in this country- we have new fleets of trains, competition and one of the very best rail networks in the world. So to the East Coast franchise- should it be tendered back out to a private operator, and what should happen to DOR? In my view the answer is simple- Yes, the route should be tendered out as a franchise BUT the government (under DOR) should bid to run it. This isn't quite as stupid as it first sounds and is a model which is used in many other parts of Europe where national rail networks have been opened up to competition under EU laws. Competition in Germany is shaking up the railways in a big way- local authorities are tendering out rail routes to interested bidders- if Deutsche Bahn (DB) want to continue to run the tendered services they must simply put in a competitive bid just like any other perspective operator. This is good for competition, and good for the traveling public as it ensures the best deal is achieved for the rail network- no longer can DB rest on their laurels as the only option to provide rail services. Could this work in the UK? I don't see why not. If the private bidders can forecast a profit from running East Coast then so can DOR. If there are cost savings through the operator being government run and not paying out to shareholders then these can be factored in also- if this enables DOR to put together a cheaper, more competitive bid then great. If DOR can win the franchise through competitive tender then it should continue to run trains on the East Coast Route. Clearly at this stage in the process this will not happen. The tender process is now too advanced for a government backed bidder to enter the process- there would also be issues regarding conflict of interest which would need to be resolved before the Department for Transport could award a contract to another government body. But maybe, in the future, this model could be used to bring a new level of competition to the railways of the UK. In Germany national operator DB bids against private competition to retain rail concessions. 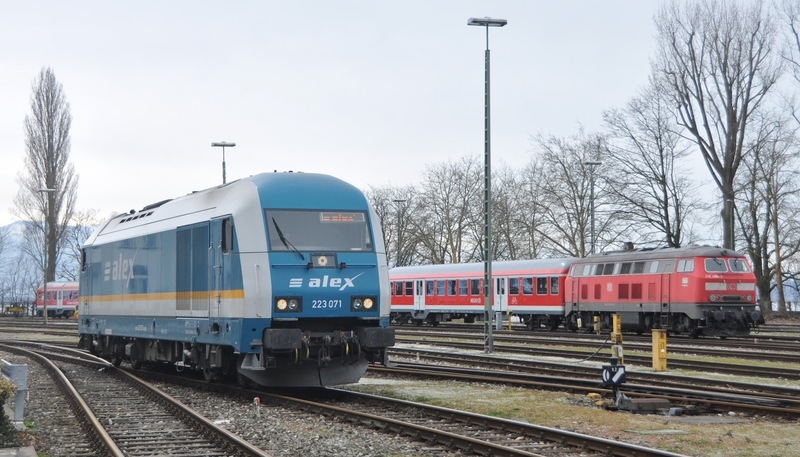 One service which is no longer in the hands of DB is the ALEX operation in Bavaria which was tendered to Arriva starting in 2003. Alex and DB locomotives are seen together between duties at Lindau.